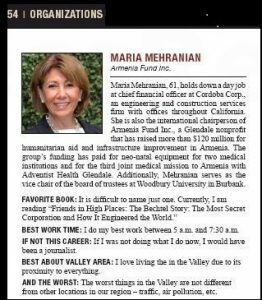 Cordoba Corporation‘s Managing Partner and Chief Financial Officer (CFO) Maria Mehranian has been recognized by the San Fernando Valley Business Journal as one of this year’s Top 200 Influential Leaders in the Valley Area. 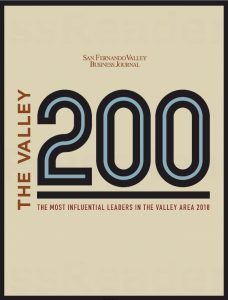 “The Valley 200” is an annual list published by the San Fernando Valley Business Journal recognizing leaders in the five-Valley area consisting of Antelope Valley, Conejo Valley, San Fernando Valley, Santa Clarita Valley, and Simi Valley. Maria is recognized in The Valley 200 list under “Organizations” for her role as the International Chairperson of Armenia Fund, Inc., a Glendale-based nonprofit organization that has raised more than $120 million for humanitarian aid and infrastructure development in Armenia. The Valley 200 feature about Maria also notes her “day job” as CFO of Cordoba Corporation, a California based full-service engineering, construction management and program management firm specializing in the delivery of infrastructure projects in the transportation, water, energy, and education sectors. About Cordoba Corporation: Founded in 1983, Cordoba Corporation is statewide full-service engineering, construction management and program management firm specializing in the delivery of infrastructure projects in transportation, education, water and energy sectors. Cordoba Corporation has offices in Sacramento, San Francisco, Chatsworth, Los Angeles, Santa Ana and San Diego, and has been recognized by Engineering News-Record as a Top 50 Program Management Firm, Top 100 Construction Management-for-Fee Firm in the nation, and a Top 100 Design Firm in California.